Conversation with Form can be seen as providing the basic skills with which you can do Interactive Plays where a single form is the product of cooperation among two or more designers, or of distribution of design tasks among them. The Silent Game that is the subject of this post is from a study funded by the National Science Foundation USA titled ‘Concept Design Games’ long before the idea of DesignPlays was known. It is, however, an excellent introduction to Interactive Plays and is easy to set up and play with, but less easy to be played well. Try your hand at this play with pieces of your choice. I intend to discuss more interactive plays in this website. 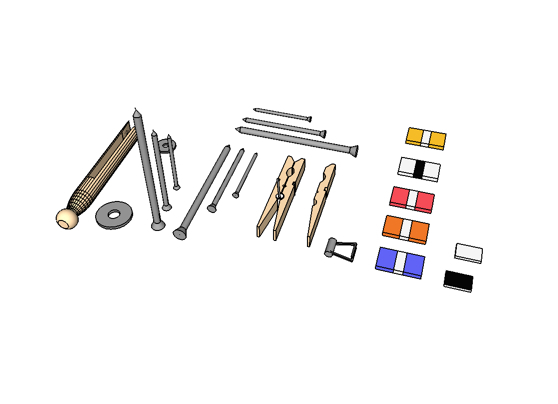 The library of parts shown in this post is available in SketchUP format. But the nails, washers and clothespin parts are of course readily available in any household store. Playing with real pieces is by far the easiest and is recommended to become familiar with this kind of play. But that makes it difficult to keep a record of a play. One way to record is by making photo pictures at each turn. Another way is for a skilled Sketchup modeller to copy each move in a model. However, when you want to do this interactive play with someone in another country or city you need the digital library. The first of you who wants one can send me an email and I will send the file. However, once you see the library used in someone else’s post, please ask that person to pass on the SketchUp library file. By the way, the multi coloured slabs in the library as shown are from plastic pieces of a larger alternative library that does not mix easily with the nails and clothespin one. Feel free to expand the selection and play with it or make your own mixed selection.